When you get three Bonus symbols on reels 1, 2 and 3 on a played line, you`ll initiateï¿½the Free Spins bonus and win 6 free games. Free Spins may also be awarded at the end of a game that does not initiate the bonus with the Bonus symbol in a winning combination. 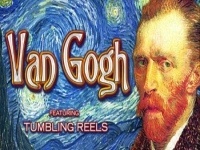 ï¿½You can re-trigger the free spins which is great, and win up to 300 free spins in a row!Famous Art Scatters In the Free Spins round, the three famous Van Gogh paintings in this slot are all scatters! It doesn`t matter where on the reels they are but if you hit three or more, you`ll win a prize of up to 600x your stakeï¿½per spin.Tumbling Reels Featureï¿½– ï¿½In the Tumbling Reels feature, all symbols in a winning combination will disappear and those spaces are filled with symbols from above dropping into place giving you a free re-spin. As long as you keep winning, the reels will keep re-spinning!Wild Symbol The symbol with WILD written across it is the game`s wild symbol. 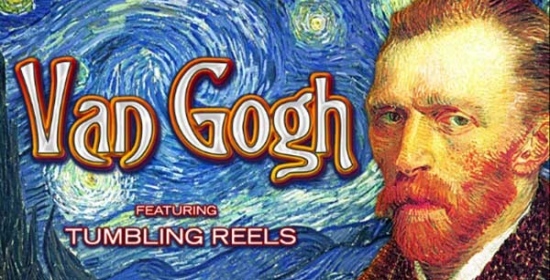 ï¿½It will substitute for the Van Gogh Logo, the three paintings, and card symbols Queen through Ace. ï¿½The Wild shows only on reels 2, 3 and 4. Wild Mummy - Bonus Feature 20 Line Slot from Amaya. Thundering Zeus - Bonus Feature 20 Line Slot from Amaya. Triple Inferno - Progressive 20 Line Slot from Ash Gaming.